I am personally not an adherent of the war metal bands of this era, probably because almost all of them are just repeating the activities of their predecessors. War metal is a less creative genre without any doubt, but Singahell’s war metal horde Nechbeyth has showcased the supremacy to create some barbaric materials that are way superior to the materials of most of their contemporaries. Their latest annihilation “Coerce Creed” released through Iron Bonehead Productions has enchanted my pair of ears. Bestial annihilation of the album initiated with an intro and instrumental track KMST Oath. Following three chapters of the annihilation, “Ruination Conquest”, “Eradication Vertex” and “Coerce Axiom” reflect the influences of Canadian bestial black/death metallers such as Conqueror, Revenge and Axis of Advance. Meanwhile influences also derived here from Inquisition, Katharsis and even from the Scandinavian orthodox black metal sounds. Past releases of the war trio were strongly influenced from the materials of Conqueror and Revenge, whereas in this release variety of influence can be observed. Combination of bone chilling screeches along with wicked drum hammering is remarkable in “Coerce Axiom”. Ending obliteration, “Lynch Directive” would be regarded as the most interesting offering from the extended play due to its iniquitous riffing and the overall spiteful composition. It just demonstrates the abilities of this Singaporean ensemble to create sensational black/death composition. Outro illustrates the consequence after the sonic rampages caused in the antecedent tracks. Vocal Zavael perfectly encapsulates the elements of both black and death metal with total aggression. His demonic voice causes a frightening atmosphere of war and violence. Smashing blast beats of the drumming would surely cause an aural damage to the listeners. Even though a session drummer handled the apocalyptic drum slaughtering, question should not be existed to identify the marvelous drumming deliveries. Aside the chaotic riffs, impending chord progression is audible from guitar works. Bass sound cannot be discerned discretely. Production wise the album is way perspicuous (considering this sub-genre). 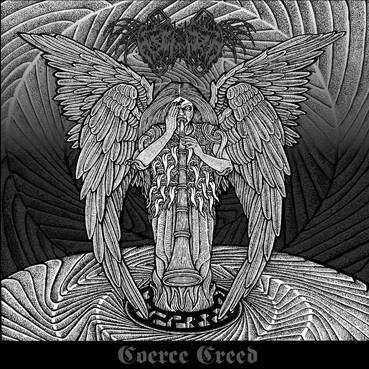 “Coerce Creed” is a step up from the previous releases of the band. Recommended for the fans of both war metal and old school black metal.